China has successfully developed a high-speed, intelligent unmanned sea vessel, People's Liberation Army (PLA) Daily reported. According to Xinhua, the "SeaFly-01" finished a test at Nanhu Lake in Wuhan on Oct. 27. The 10.25-meter-long vessel has a maximum speed of 45 knots. It was built with carbon fiber material, and is equipped with BeiDou communication navigation technology. It is able to "learn" independently and avoid obstacles, among other functions. 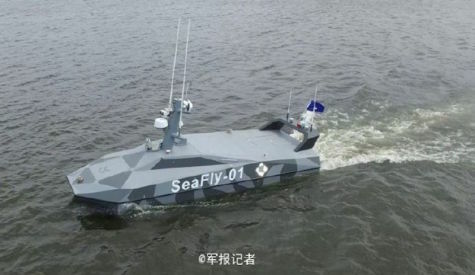 The vessel is able to carry a photoelectric scout device, light weapons, sonar and other equipment, and can be used in a wide range of applications, including coastal patrol, armed confrontation, submarine detection and water-quality monitoring. "All the core equipment was developed by us, and the localization rate is 100 percent," said Liu Fei, a technician for Sifang, the developer of the vessel.